UConn broke open a tight game in the fourth quarter to roll past Notre Dame at a sold-out Purcell Pavilion, 89 to 71. 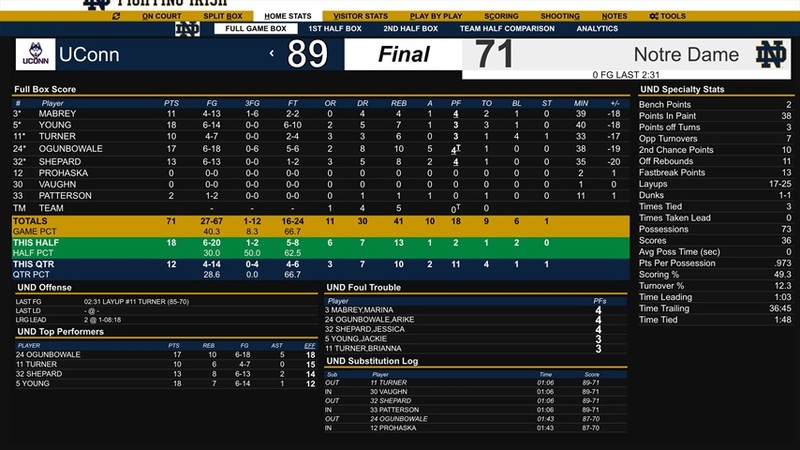 Similar to the in-season game last year, when the Huskies outscored the Irish in the final quarter by 17, UConn took advantage of Notre Dame’s defensive break-downs, scored timely baskets, and went 12 for 14 from the line to outscore the Irish by 12 over the final 10 minutes. Led by freshman guard, Christyn Williams, who scored 16 of her game-high 28 points in the first quarter (7 for 8 from the field including 2 for 3 three-point shots in the first ten minutes), the Huskies took a five-point lead after one. ND closed to within three at half-time at 44-41 but missed numerous opportunities to tighten the game more. The Irish shot the ball well at 54% but missed three free throws in the quarter — a pattern that persisted the entire game. 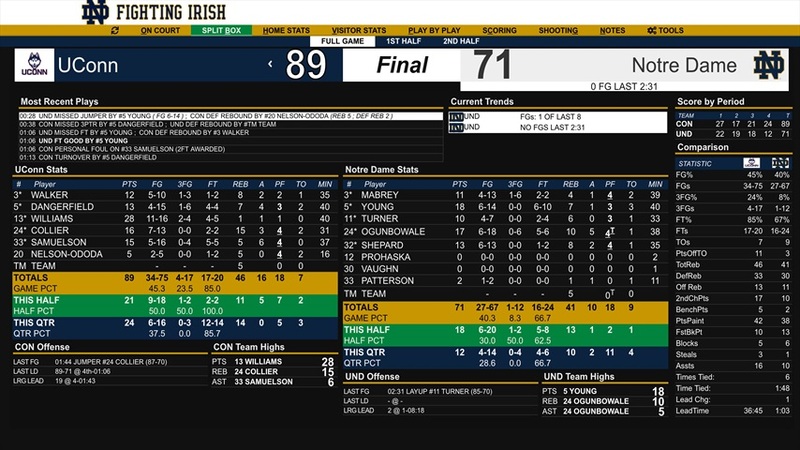 Notre Dame started the third quarter missing four of its first five shots, and UConn stretched the lead to eight in the first two minutes of the quarter. ND clawed its way back to trail by just two four minutes later when Marina Mabrey made Notre Dame’s only three-point basket of the contest. But that was as close as the Irish would get the rest of the way. 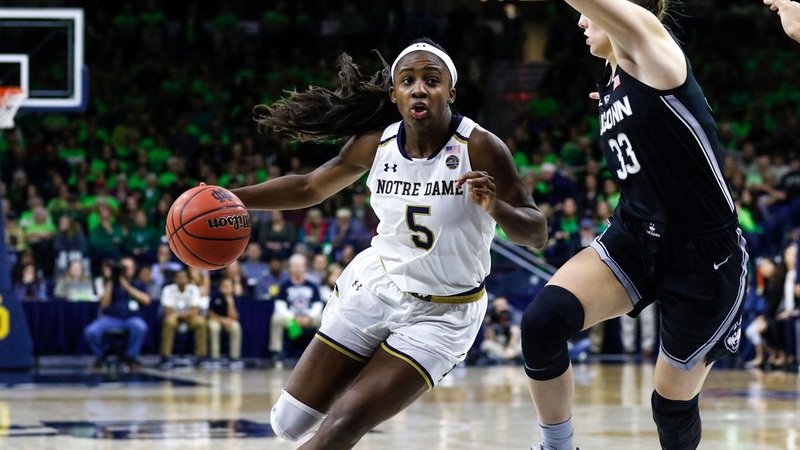 Coach Muffet McGraw thought her team played poorly on defense but was really surprised by the lack of poise in the fourth quarter, including a technical foul called on Arike Ogunbowale. In the end, UConn won easily on a night when their three returning starters from last year — Katie Lou Samuelson, Napheesa Collier and Crystal Dangerfield, shot a combined 16 for 44 from the field and 1 for 10 from three. Samuelson, who is the team’s leading scorer, went 0 for 7 in the first half and failed to score. She scored 15 in the second half with six assists. Collier, who sat much of the fourth quarter with foul trouble, added 16 points and a game-high 15 rebounds. Jackie Young led the Irish scoring with 18 points. Ogunbowale scored 10 first quarter points, but only managed seven the rest of the game to finish with 17. She was 0-5 from the field in the fourth quarter. She did lead the team in rebounding with 10 and in assists with 5. After shooting better than 50% from the field in the first half (17 for 33), ND only managed to make 10 of 34 shots after the break). The Irish went 16 for 24 from the line. Katlyn Gilbert, who injured her shoulder in Thursday’s win over Iowa, will likely be out at least two weeks. Still no word on when fellow freshman Jordan Nixon will return to play after suffering a concussion over two weeks ago.